The Quilt Raffle is Here! Once again, Peralta students have worked with Artist-in-Residence Ellen Oppenheimer to create a stunning, one-of-a-kind quilt. Perhaps someone in your extended family, or one of your friends and colleagues, will be the lucky winner of this year's raffle! The drawing will be June, 17 at the Peralta graduation. 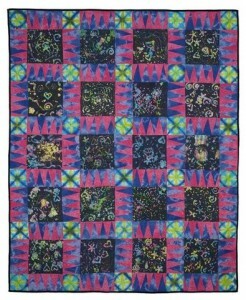 Peralta kids were involved in making the quilt from start to finish, from designing the pattern, to dying the cloth, and even assembling and sewing. Peralta quilts hang in the U.S. embassy in Moscow as well as at Kaiser Permanente headquarters, Children's Hospital Oakland, and other public venues. They were recently exhibited at the San Francisco Airport. Students are now selling raffle tickets: $1 each for $5 for six tickets. Each child was given a packet of 30 tickets, but if you sell out, there are plenty more to be had! In the past, some families have set up tables at farmer's markets or grocery stores, and some employers are willing to make matching donations for all tickets sold. If you are out selling tickets, download a copy of this full-color flier to take with you! Please return all ticket stubs in an envelope with your name on it to Sonia in the library. She can also give you more tickets if you need them. Newer:Think Before You Toss: Spring Fest Hits Record in Reducing Landfill WasteOlder:Don't Forget!